Welcome to the Rocking M Ranch pedigree assignment page! 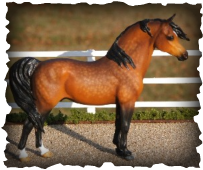 On this page, you will find our online collection of model horses, featuring our sire & dams for hire. Please note: All horses featured on this page are model horses or paper identities only. The use of real horse names and pedigree information is for educational and research purposes only. For more information on pedigree assignment, please visit the IPABRA website. No fees for IPABRA members or for electronic pedigrees. Electronic breedings are postage free but you must be able to receive Microsoft Word attachments. All others: $.25 per horse used (any gender) w/business sized envelope with one stamp per 4 breedings required for mailed breedings. Extended pedigrees available for some horses by request only. Please send no more than 4 breeding requests at one time. Pedigrees will be filled on a first come, first serve basis. Due to personal time constraints, I cannot guarantee the turnaround time for breeding certificates. Foals must be at least 4 years younger than parents at the time of breeding. Open years will be shown for mares or inquire if not posted. Extended open dates may be available by request. Non-aging parents may produce any age foals. No breeding of parents and offspring or full siblings allowed. Real horses are denoted with a ®; Horses that do not have bodies are denoted as BSO. The use of a real horse name does not imply ownership unless noted and is intended for educational research purposes only. Color genetics should be adhered to. If you are unsure of genetics, please have one parent be the same color/pattern of your foal. Please send the following information with your request: Name, age, breed, gender and color/pattern. The same information is required on outside parents plus a pedigree and owners name.